So far, much of this discussion has centered on issues relating to the costs of the immediate medical services provided to accident victims in Michigan. But Michigan’s PIP system provides a wider range of benefits than just paying for the charges one might incur from receiving treatment at a hospital after being injured in an automobile accident. For instance, PIP includes work loss and replacement services benefits. Work loss benefits are capped at three years and 85 percent of gross earnings and replacement services are capped at $20 per day for up to three years. Replacement services are designed to cover the cost of services in and around the home that cannot be accomplished by the injured person as the result of an injury from an automobile accident. These benefits increase the cost of the required PIP coverage all insured Michigan drivers must purchase. Michigan’s PIP laws also mandate that insurers pay for medical services known as “attendant care.” Attendant care is providing medical aid to an automobile accident victim and includes tasks such as helping the person bathe, use the toilet, take medication, travel for medical purposes and administer to other medical needs. In most cases, these services are provided to the accident victim in their own home and provided by friends or family members, who do not necessarily have any medical training nor are they required to. These attendant care providers are then paid by the injured person’s auto insurer. No written contract need exist between attendant care providers and their “patients.” Rather, all that is required is documentation that care was provided. Like other aspects of medical coverage under the no-fault law, the amount that can be billed as attendant care has no limit other than that it be deemed “reasonable.” As such, there is no standard attendant care rate nor is there any limit on the number of hours of attendant care that can be provided. An attendant care provider can bill an insurance provider for 24 hours of service per day at whatever rate they think a court would deem reasonable under the circumstances. Based on this author’s experience, attendant care rates can vary from as low as $8 per hour to as high as $30 per hour. In cases of attendant care being provided to victims with serious injuries, it is not uncommon to see family members receiving annual payouts that exceed $100,000. There are, of course, cases where extensive and expensive attendant care is needed and where it is an economically valuable alternative to institutional care. The problem, however, is the challenge of reliably verifying when the scope and extent of attendant care in the home by untrained family members is the best option and as such it is rife for abuse. This is not to suggest or imply that most or many attendant care providers cheat, but the point remains that it is very difficult to discern when attendant care providers are needed and when they are taking advantage of the system for their own personal gain. MCL § 500.3107(b); MCL § 500.3107(c). Although, there is no specific provision in the law that specifies attendant care as one of PIP’s covered costs. The “allowable expenses” under MCL § 500.3107(1)(a) have been interpreted to include attendant care as a result of case law, specifically Vanmarter v. American Fidelity 114 Mich App 171 (1982) and an attorney general opinion, OAG no. 6155 (1983). Spouses can be compensated under MCL § 500.3107 for providing home care to those injured in auto accidents. 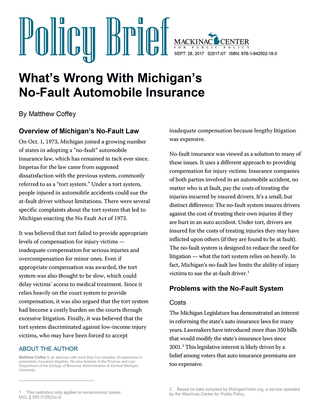 For more about attendant care, see Steven Gursten, “Michigan No-Fault Law 101: What Is Attendant Care?” (Michigan Auto Law, Jan. 4, 2012), https://perma.cc/E5EK-LBMX; “Important Case Law about Michigan Attendant Care after an Accident” (Michigan Auto Law, 2017), https://perma.cc/7NDS-U685.